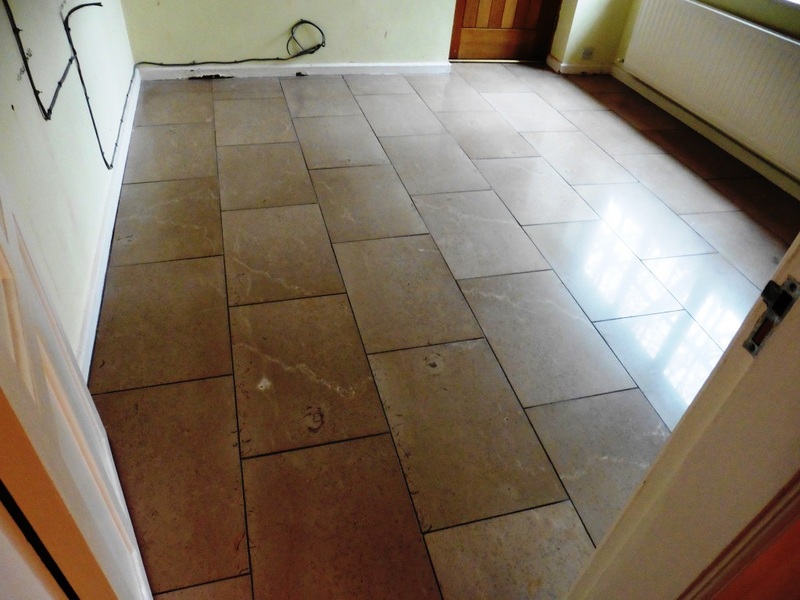 This customer had recently bought a house in Shrewsbury and was in the process of refurbishing it including replacing the kitchen which when I arrived had been removed leaving an area of flooring which was a different shade to the rest. Additionally the floor has been very badly laid resulting in lippage problems between the tiles and in some places there was a 3mm difference in the level between adjacent tiles. To make things worse there had a leak in the bathroom above which caused the ceiling to come down leaving a big mess in the utility room. The polished Limestone tiles needed to be cut back and refinished with a set of diamond encrusted burnishing pads however my first task was to clean the grout lines by applying a medium dilution of Tile Doctor Pro-Clean and scrubbing it into the Kitchen and Utility grout with a stiff narrow brush. I gave the grout a rinse with hot water and removed the now soiled water with a wet vacuum. 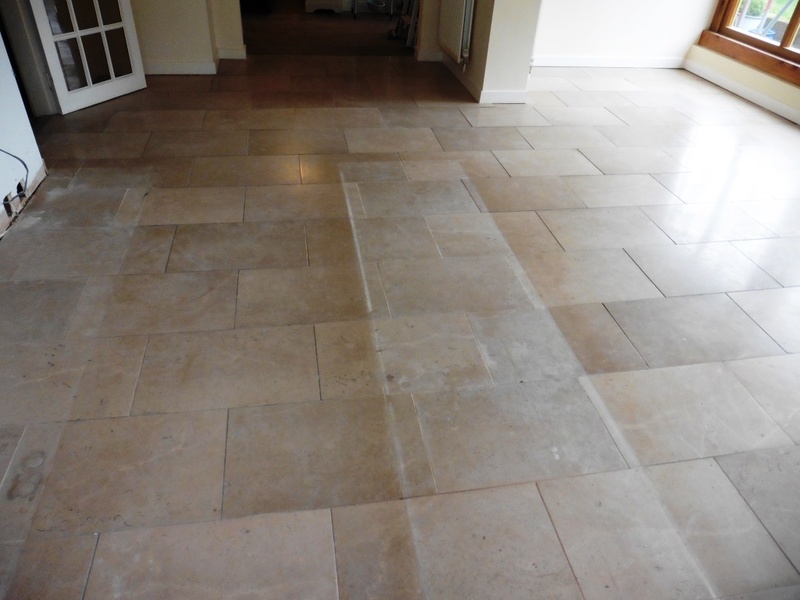 I had spoken to the customer earlier about the lippage problem and recommended that we could resolve it with a set of very coarse milling pads which effectively grind away at the Limestone until the whole floor is completely flat. The customer was not keen on this and after discussing the options I agreed to treat the most problematic edges with a handheld machine and set of six inch burnishing pads which gave a fairly good result. The burnishing process requires the application of four different grades of diamond pad fitted to my rotary floor machine and lubricated with a little water. You start with the coarse pad which removes the dirt from the Limestone and you move onto the medium, fine and superfine polishing pads until the surface is restored. The process requires the floor to be rinsed between the application of each pad and this needs to be removed using a wet vacuum. 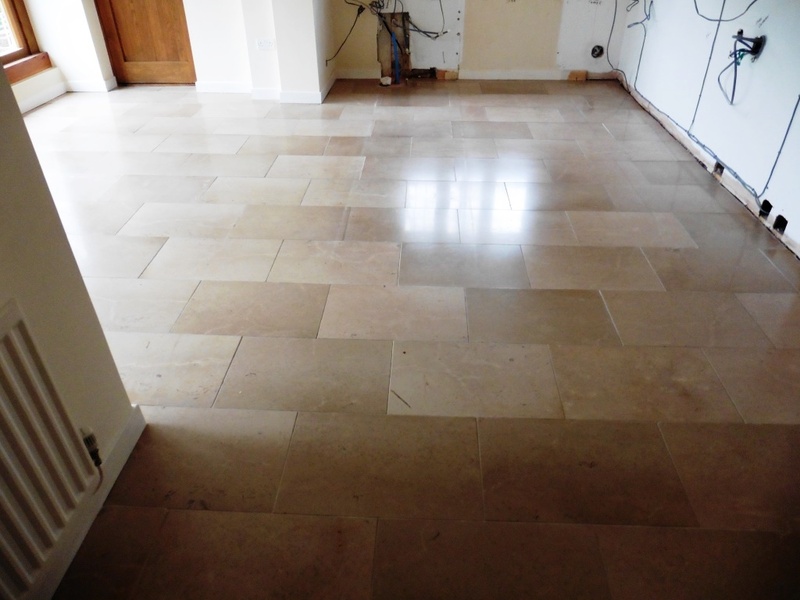 Once I had finished polishing and the floor was dry I applied a single coat of Tile Doctor Colour Grow which impregnates into the pores of the tile to prevent other contaminates getting in there; Colour Grow also does a great job of bringing out the natural colours in the stone. 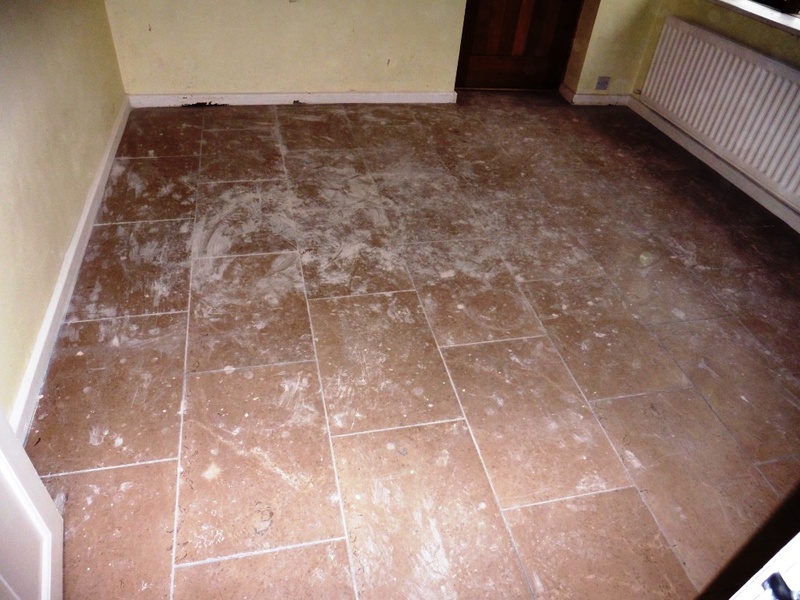 This entry was posted in Limestone Posts and tagged kitchen, limestone tiles, Shrewsbury, shropshire, tile cleaning, tile sealing, utility by AbzDominise. Bookmark the permalink. It may seem obvious but its always best to get a professional to lay expensive floor tiles, it will save you money in the long run as its quite a skill getting them even.